The Amaris Apartments are ideally located just a 10 minute walk from the beach and main road of Marmaris and just a short minibus ride to the town centre, with its amazing shopping bazaar and marina promenade. Book the modern and attractive Amaris Apartments for that great family, couples or singles holiday in the bustling resort of Marmaris. 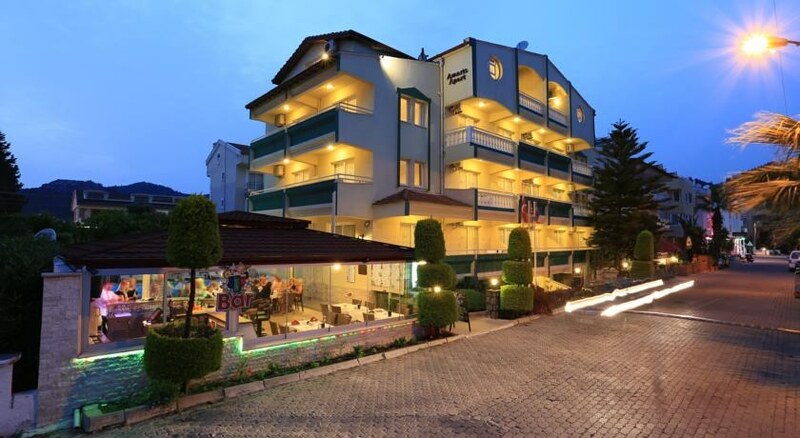 Dalaman airport is approximately 90 kilometres from the Amaris Apartments. A diverse selection of restaurants, bars, shops and evening entertainment are situated within easy walking distance. Food, Drink and Entertainment: Mini Market (next door), Pool Bar/snack bar, restaurant, occasional Turkish nights and entertainment. Sport, Games and Activities: Swimming Pool with children's section, TV lounge in reception. Additional: 24 Hour Reception, Safe Deposit Box (local charge), Internet Connection, Laundry Service and Room Service (available 08:00 – Midnight). The Amaris Apartments feature 22 one bedroom apartments and six studio rooms. The one bedroom apartments have a separate bedroom and living room with double sofa bed, and a wide balcony offering Mediterranean garden, pool or mountain views. All apartments have a kitchenette and shower room, kitchen facilities include 2 electric rings, fridge, kettle and toaster. Other facilities include hair dryer, air-conditioning (extra charge, 30 GBP per week), direct dial telephone.